It was the Canadian Armed Forces Appreciation Day at BMO Field and Toronto FC would put on a great show for our forces. The final result would be 4-0 for the team as they clinched a playoff spot in the process. A CF18 flies over BMO Field for Canadian Armed Forces Appreciation Day in 2017. Image by Dennis Marciniak of denMAR Media. Víctor Vázquez crossing the ball into the attacking 18 yard box during a match against the San Jose Earthquakes. Image by Dennis Marciniak of denMAR Media. Jozy Altidore flicks the ball behind is back to get an advantage on a defender at BMO Field of a MLS Regular Season match. Image by Dennis Marciniak of denMAR Media. Víctor Vázquez gets it past the goalkeeper for the first goal of the day against the San Jose Earthquakes. Image by Dennis Marciniak of denMAR Media. Víctor Vázquez celebrates with Steven Betiashour for the first goal on the day against San Jose. Image by Dennis Marciniak of denMAR Media. South End supporters celebrate amidst the red smoke after the first goal on the day. Image by Dennis Marciniak. Steven Betiashour trying to get the ball from a defender shot between Toronto FC subsitutues. Sebastian Giovinco and a San Jose Earthquakes player clash in a shaft of light during a regular season MLS match. Image by Dennis Marciniak of denMAR Media. Sebastian Giovinco blasts a free kick at the net during a Major League Soccer regular season game in 2017. Image by Dennis Marciniak of denMAR Media. 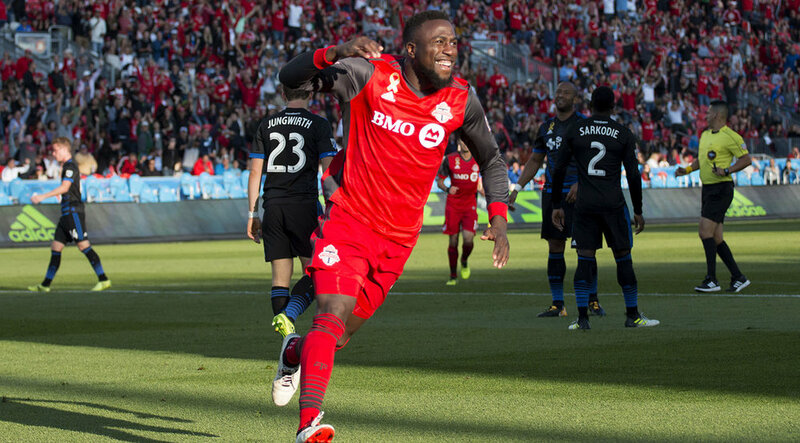 Jozy Altidore celebrates a goal during the second half against the San Jose Earthquakes in September of 2017. Image by Dennis Marciniak of denMAR Media. The ball hitting the back of the net as Jozy Alitdore scores his second goal of the day in 2017. Image by Dennis Marciniak of denMAR Media. Toronto FC celebrates a goal. Image by Dennis Marciniak of denMAR Media. Jonathan Osorio blasts a shot towards the San Jose Earthquakes net which results in a goal. Image by Dennis Marciniak of denMAR Media. The south end supporter's section goes wild over a fourth goal at BMO Field against the San Jose Earthquakes. Image by Dennis Marciniak of denMAR Media. Referee Jose Carlos Rivero check the call by Video Assistant Referee Yusri Rudolf that would result in a red card during the first Video Review at BMO Field. Image by Dennis Marciniak of denMAR Media. Armando Cooper, Jay Champan and Marky Delgado celebrating the 4-0 victory over the San Jose Earthquakes in 2017. Image by Dennis Marciniak of denMAR Media.